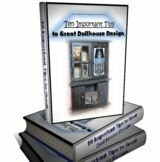 Where do you get free dollhouse plans? This is the question that miniature enthusiasts are asking. But are these types of designs available? One has to assume that somewhere we can find these kinds of resources both online or off. Do an online search of the best sites out there. Ask someone you know who is knowledgeable in building and designing. Try your own design ideas out. And lastly my favorite resource, look in and study books available to you from your local bookstore, library or online. First of all, start with an online search at your favorite search engine. Wherever you prefer to go is okay. I did choose Google just because it's my habit. And as we all know old habits die hard. All of the above mentioned sites have illustrations of their designs available as well. Better Homes and Gardens has a beautiful plan online for a mini doll's home built from a bookcase. Ask instead these types of individuals... Whether it is a family member or a knowledgeable stranger someone referred you to, keep in mind that their time is valuable to them. Even if you want a "cost you nothing" plan and think these people will supply you with one, have a heart for them and do something in exchange for their time and effort. Yes in other words do not be totally cheap! If you can not do anything else, at least trade your time for theirs. I bet you do have your own design ideas. Personally, I want to encourage you with developing them further. So what if your first attempts were not what you thought they would be. Don't quit so easy. Give yourself time to develop your talents. You can do anything you set your mind to. Look at some of the great inventors. Think of how often some of them failed. Keep on learning and have fun while you do. You CAN succeed. Books are relatively inexpensive these days. Going to book sites online and you get that idea for sure. Books are available when and where you are. Books don't complain about giving you their time. Books are usually smarter than you are. Or at least you hope or you wouldn't have bought it, lol. Books can be studied and mixed with each other to entertain and enlighten you more. Here on this page you will find several of the great books I recommend, enjoy, even drool over and dream of owning. In time they may all be mine. No they really are not "free dollhouse plans" when you think of it. All these designs provide you with is a small starting point. What you have to count on is that they will at some point require your very own input and time. Even if they are extremely well done they will all eventually cost you something. Whether in the time or in the cost of materials or even if you have to add more knowledge to them and seek out a professional, they do all cost something in the end.